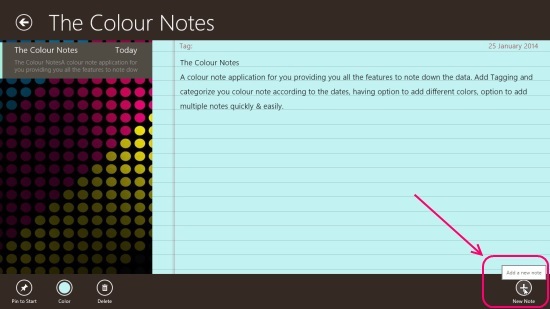 The Colour Notes is a free Windows 8 note taking app that lets you take multiple notes, save, and share them easily. You can use this simple useful tool to note down important things on your Windows 8 system. You can add multiple notes in different colors and categorize them according to dates. You can also Share notes via e-mail using the Windows 8 Share charm. 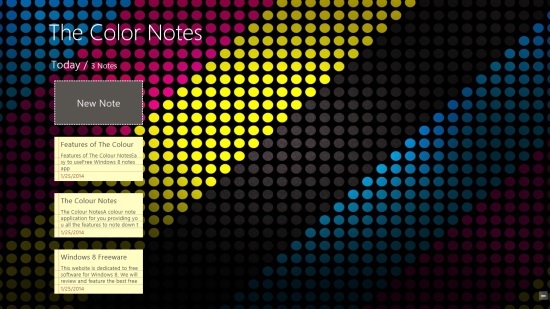 This free Windows 8 note taking app also allows you to pin your important notes to the Start screen of your Windows 8 system. You can take backup of your notes and restore them anytime. Apart from this, the app provides a Recycle Bin of its own that contains all your deleted notes. Thus, your notes don’t get permanently deleted from the app. The Colour Notes app is freely available under Productivity category of Windows Store. You can also view it directly by clicking on the link given at the end. Let’s see how you can use this app to take notes. To make use of this free Windows 8 note taking app, you just need to install and launch this app on your Windows 8 system. And its ready to take notes! As you land on the app’s main screen, click on New Note to open the notepad on the second screen. Your notepad will appear on the right side of the screen where you can type notes. The app will simultaneously generate a date wise list of your notes which will be displayed on the left side of the screen. As you do a right click on the screen (not on the notepad), the top and bottom flyout appear. The bottom flyout have options of Pin to Start, Colour, and Delete on the left side. Using the Pin to Start button, you can pin individual notes to your start screen. The Colour option offers to set colours to your notes sheet. You can delete a note using the Delete button. The deleted notes will get saved in the Recycle Bin of the app. You can go to this Recycle Bin by right-clicking on the main screen and then clicking the Recycle Bin option from the upper flyout that appears. From this screen, you can either restore the notes back or delete them permanently. On the right side of the bottom flyout, the option to add New Note appears. You can use this button to add multiple colour notes. The top flyout shows the back arrow button that will take you back to the main screen. The main screen of the app also displays a date wise list of notes prepared in the app. You can click on any of these to refer to that specific note. 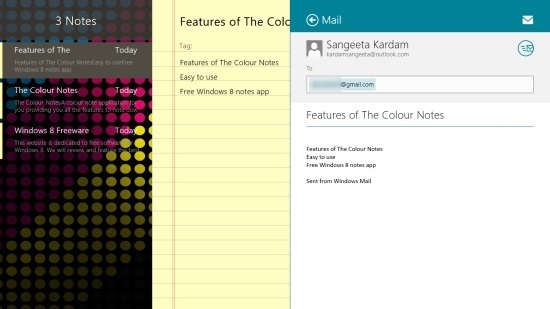 Free Windows 8 note taking app. Categorize your notes according to dates. Option to add multiple colour notes. Option to pin notes to Start screen. Option to take backup of notes. App’s own Recycle Bin for deleted notes. Also checkout some other free note taking apps and some free to-do list apps we reviewed earlier. 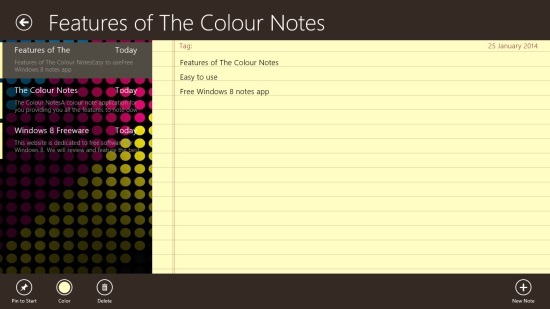 The Colour Notes is a useful free Windows 8 note taking app that helps you prepare multiple colour notes and share them via e-mail. 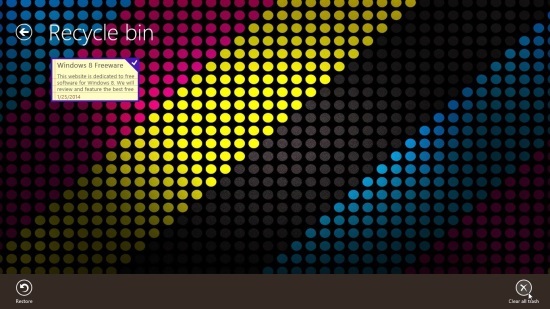 The app also has its own Recycle Bin that lets you recover any deleted notes. Go ahead and use this notes app to take notes on your system. Share your feedback via comments. Get The Colour Notes here.